A drift towards towns from Preston can be detected. Twenty-eight had relocated to Hitchin, Luton and Dunstable and 15 were living in London. The census was counted on 7 April. There were 420 inhabitants in Preston that day - 207 males and 214 females. They included 68 couples and 16 widows or widowers. They occupied 78 homes - an average of 4.8 residents in each cottage. Five houses were uninhabited. Eight farms and the house at Temple Dinsley were also occupied. The oldest villager was Phoebe Pedder who was living at Kilnwood House. She was 86 in 1861 and died in 1864. The youngest child in Preston was one-month-old Arthur Aldridge at Hill End. Children aged under 20 (206) were more than half of the local poulation - 49%. 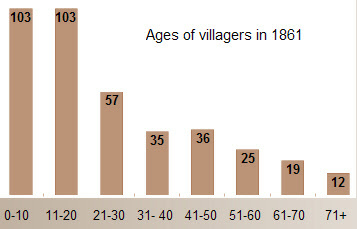 Of the 411 surviving villagers who were counted in 1851, 241 were still in Preston ten years later - 59%. Sixty-two more were living within five miles of the village. 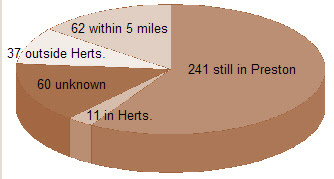 While 60 can not be traced in 1861, 11 had moved further away but still in Hertfordshire and 37 were living outside the county. No villager was recorded as receiving parish relief and 100 were straw plaiters. The oldest plaiter was the nimble-fingered Ann Walker, aged 76, and the youngest home worker was the five-year-old, William Fairey (who was my great grand uncle). Link to transcription of 1861 Preston census. Link to alphabetical list of names in 1861 Preston census.